Home / Big Chocolate Tea Party! Staff raised money for the Sick Children’s Trust in a Big Chocolate Tea Party coinciding with a Great Campus Bake Off today! There were tons of beautiful creations (and plenty of competition!). 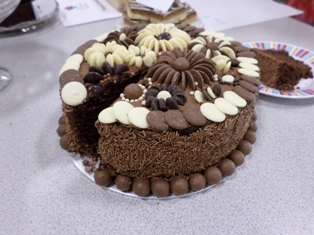 Mrs Chadwick, Mrs Juckes and Mr Marsden were judges of the Bake Off, and plenty of money was raised at break time with staff buying sweet treats. Thank you to all staff who donated cakes and money! The total was just over £90 – amazing!